Prominent & Leading Supplier and Manufacturer from Ahmedabad, we offer Ceramic Products such as Ceramic Cloth, Ceramic Braided Packing and Ceramic Tape. We are engaged in Manufacturing and Supplying Ceramic Fiber . Ceramic Fiber is an alumino silicate based refractory fiber that is widely appreciated by the clients for its various properties. 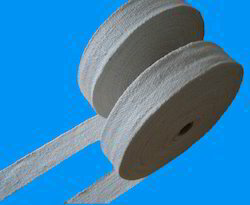 We are a prominent Ceramic Fiber manufacturer and supplier based in India. 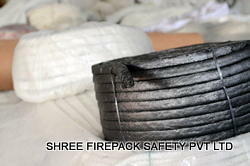 Shree firepack safety pvt ltdspecializes in offering qualitative range of Ceramic Fiber Also our range of product include like yarn, ropes,cloth, webbing tapes, fire blanket, aprons, suits,welding blanket,coated & uncoated fabrics made of asbestos, non asbestos material like glass fiber, cermaic fiber & silica. 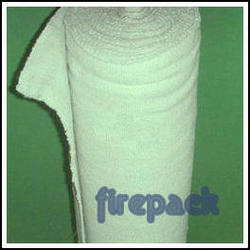 We are a prominent Ceramic Fiber Insulation manufacturer and supplier based in India. 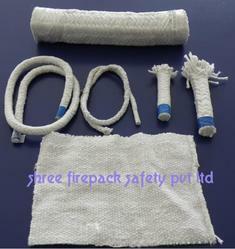 Shree firepack safety pvt ltd specializes in offering qualitative range of Ceramic Fiber Insulation. Also our range of product include like yarn, ropes, cloth, webbing tapes, fire blanket, aprons, suits, welding blanket, coated & uncoated fabrics made of asbestos, non asbestos material like glass fiber, ceramic fiber & silica. Being the renowned suppliers and manufacturers of Ceramic products, we are offering Ceramic Tape that is made from the best-quality ceramic yarn. Various sectors in which ceramic tapes are used include welding, chemical plants, power plants, exhaust systems, shipyards, refineries, foundry works, aluminium and steel mills, and boiler insulation and seal. We also supply quality Ceramic Cloth and Ceramic Braided Packing. We are offering high-quality Ceramic Cloth that is manufactured using top-grade ceramic fiber yarn. It is available in various sizes, but the length can be customized as per clients' requirements. The product finds use in high-temperature applications up to 2300 F. Some such applications include expansion joints, safety blankets, curtains, protective and insulating covers, welding blankets, Shields, gaskets, and cable or pipe wrapping. We are the leading manufacturer, supplier and importer of Ceramic Fiber Board.